Today we're talking Lip Crayons. Lip Crayons look like cute fat Crayola that comes in all sorts of colours and in all sorts of finishes; matte's, sheer, balm, glossy, satin and lip stains. They are very easy to apply on your lips with just one swipe and you can easily adjust the amount of coverage. I'm sharing all my Lip Crayons that I have collected so far. Starting with 'The Chubbies'. These are all 'fatter' than the other crayon's and does not need sharpening with its twist up applicator. I have a mix of brands; Revlon, Clinique and Mac. When Revlon ColorBurst came onto the market a couple of years ago, everyone went wild for them - me included. I was only interested in the 'Matte Balm' range as I lean towards matte finishes. The colours I have are Standout - a deep red, Audacious - a vibrant orange, Striking - a classic red and Elusive - a mauvy rose pink. My most used shades are Standout, Audacious and Elusive. When you open these you can instantly smell the minty scent - it feels tingly when you apply it on the lips, I don't feel like it plumps up my lips but it is very refreshing. When I need to reapply after eating I take this all off and restart otherwise I find it a bit uneven and patchy. I do feel these are slightly drying so I apply a lip balm and let it soak for a couple of minutes in the morning. When your lips are dry the Revlon ColorBurst enhances your fines on your lips so remember to exfoliate your lips beforehand. The longevity of these are amazing but depending what you do during the day it might feel dry. These are beautiful colour and they have 14 shades in the collection. 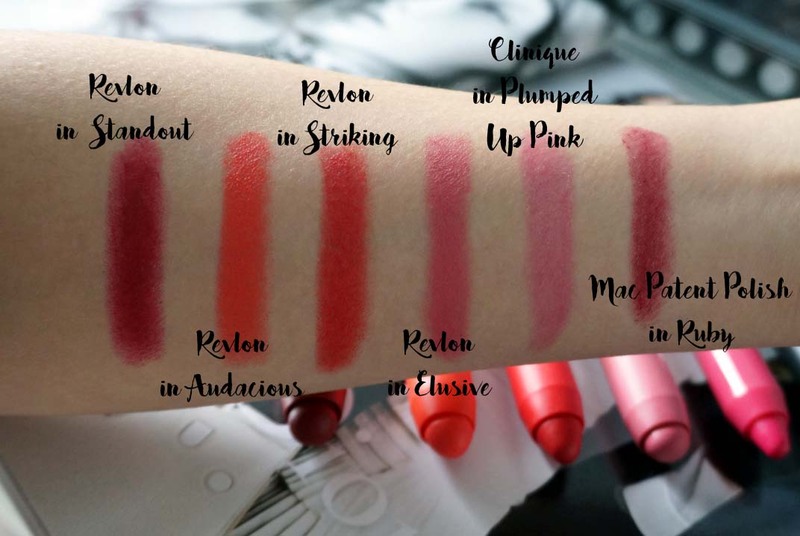 Clinique's Chubby Stick's are definitely a cult favourite. There are 16 shades in the collection. The one I own is no.17 Plumped Up Pink - I think this has been discontinued since I can't find the link on the Clinique website. However, the balm offers a sheer natural finish and has a hint of shine. This is very moisturising and helps repair your lips but it's not something that I reach for. When I want a lip balm that is just to moisturise day and night, I opt for something that has no colour. I have scars on my top lip which I want to cover and sheer coverage is not I want when I head out. Lastly in 'The Chubbies'; Mac Patent Lip Pencil in Ruby. I received this in a beauty box and I wouldn't have known that Mac has this kind of lip crayons/gloss. This is a gloss in a lip pencil format, the coverage is quite sheer and the shade Ruby is a deep cherry red tint. It has a refreshing tingly feeling like the Revlon ColourBurst. I wear this on top on a matte lip colour to add some shine and moisture. In 'The Skinnies'; these lip pencil/crayons all need to be sharpened when the tip goes down, I find it a bit annoying but some of the shades are beautiful so I can look past that. In 'The Skinnies' I have brands such as Nars, Lord & Berry and Topshop. Starting with Nars Velvet Matte Lip Pencil's, I have the shades Tortola and Walkyrie. Tortola is what I describe as a true brown - a colour that reminds me of the 90's. Walkyrie is more of a pinky brown compared to Tortola. Both of them glide easily on the lips with one swipe and is full coverage. You can layer these up which I do quite often. I find these the most comfortable to wear all day without drying up my lips. Another Nars item; Velvet Gloss Lip Pencil, the shade Club Mix is purple grape shade. It is sheer coverage with moisturising abilities like the Clinique Chubby Sticks and helps to create a fuller lip. It is lightweight and has a shine finish. To be honest I haven't picked this up once to use. I find the shade makes me look a bit ill with its purply undertone. I have two Lord & Berry 20100 Lipstick Pencil in Mandarin and Fire. Mandarin is a vibrant peachy orange and Fire is an orange-red. These lipsticks have a high shine finish and give off intense colour, they are also very comfortable to wear and long lasting. These lipstick pencils leave you with a nice tint when the wear off and is easy to reapply. Lastly Topshop Lip Crayon in Coy. Coy is a corally pink and has intense pigmentation. It has also been discontinued. The formula of this is matte and is also very drying on the lips - I have the need to constantly lick my lips when I wear this to moisturise and it also highlights every flaw and every line, so you need to exfoliate your lips beforehand. It looks quite neon when you apply the product but you can control the amount you apply for a lighter coverage. I have not used this in a long time because of the dryness. That is all for my Lip Crayon/Pencil collection. Lip crayons are great for on-the-go application and fit nicely in your handbag. I don't see myself expanding my collection anytime soon since I'm on a matte lipstick hype but I'll keep you updated. I hope these swatches have helped. Let me know if you have any lip crayons in your collection. The one that I recommendd the most will be Nars Velvet Matte Lip Pencils if you are looking for a matte formula. Lip crayons are something I only own one of! I prefer lipsticks as I feel the formula is thicker. I definitely want to try out nars make up at some point though! I've got only one lip crayon and it's my absolute favourite! I'd never really been a fan of lip crayons but these looks really nice! I'm especially loving those NARS ones!